The football season started off rocky with three initial losses. “We didn’t have the best start to the season, but we’ve battled to get back to where we are now,” senior quarterback Blake Gimbel said. For their win against Upper Iowa, Gimbel connected with wide receivers Aaron Murphy and Daniel Davis for a combined 10 receptions and 140 yards. Daniels caught the tide-changing touchdown in the third quarter to even the score at 20 points. Gimbel ended the day with 252 yards and three touchdowns. Sauter applauds his team’s performance in their fourth game of the season. “This past game with Upper Iowa, we finally had a solid performance, and everyone did a better job collectively,” Sauter said. In their next game, the Mustangs beat UMary. 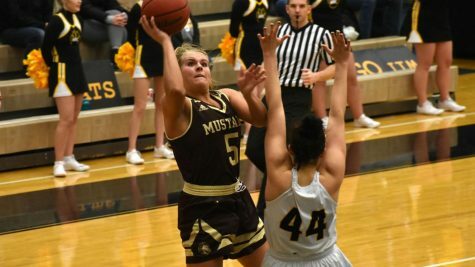 Despite a handful of turnovers, the Mustangs demolished the Peacocks 54-24. Gimbel threw for 356 yards and five touchdowns. Davis finished with 148 yards. 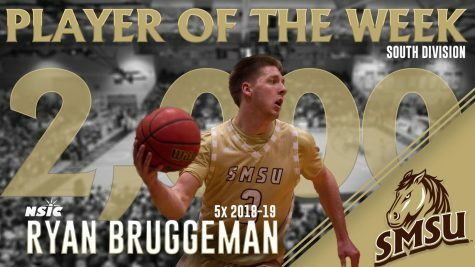 Following SMSU’s win against UMary, Gimbel received his fifth NSIC Offensive Player of the Week accolade. They play next against Crookston on Oct. 6 for SMSU’s homecoming game.